2 by 3 Heroes: And we have a new leader. Everyone has what they would consider the best card they have ever pulled. I am not talking vintage here. 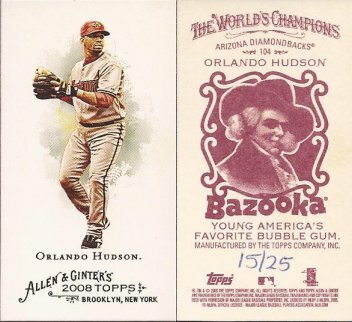 Others may have a different definition, but to me, a "pull" in sports card collecting is something you find in a pack. If I'm wrong...well, tough crap, this is my blog! Seriously, I would think most would consider a pull something you get from a pack you open. There are two kinds of great pulls I have. On the one hand, I get a great pull if I hit a card I just like - say a short print or something that meets an official or unofficial collection. On the other hand, a great pull is also something that has rarity. And here I am talking serialed (or known rares like 1/1 canary sparkles, etc.). For a long time, the "rarest" cards I had were a couple of 2011 GQ sepia minis, numbered to 99. Soon, as I understood some of the special cards, my rares became a few (and now more) no number Allen and Ginter minis, which you may know are numbered to 50. Hmm - it also seems that the sky is blue. Interesting. 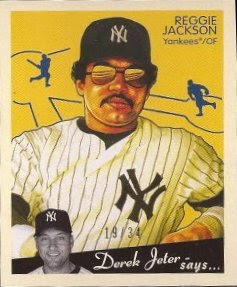 As we move down (or up) in rarity, the next rarest card that replaced the no numbers was a Reggie Jackson Goudey I pulled from a repack box, numbered 19/34. It's MISTER October. No, no....I don't care what your name is. Luckily, if you read a month or so ago, I found a card I was missing that kicked Reginald to the curb - a hand numbered Allen & Ginter 15/25. Ok...ok. So where the hell am I going? Well, as the title suggests, the number has dropped again. Picked up a couple packs of Topps Update from Walmart, and pack one gave me this. 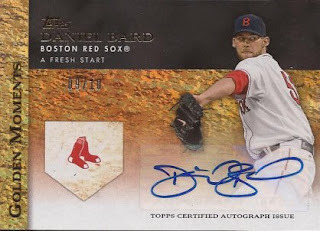 Sparkle auto, number 9/10. I hope the numbers keep going lower.